The old saying about the power of kungfu coming from within holds true when it comes to Wudang's martial arts. The fighting form indigenous to the Wudang Mountains focuses on internal motions, and complements offensive and defensive moves with inner breath control. Every year, the picturesque mountains in northwestern Hubei province attracts thousands of kungfu enthusiasts from home and abroad. Legend has it the martial art was created by Zhan Sanfeng, who came to Wudang at age 76 in the 1310s to learn Taoist alchemic arts and extend his longevity. One day, he witnessed a scuffle between a magpie and a snake on the mountain. He noticed the bird attacked by fluttering up and down, while the serpent issued counterstrikes by shifting its body and head from side to side. From observing this battle, he deduced the two guiding principles of Wudang kungfu: One must respond to a strong attacker with a gentle defense, and one must move after the enemy to use the assailant's own momentum against them. Consequently, some Wudang kungfu moves still imitate animal locomotion. And because the martial art artificer quested to stretch his lifespan, its practice is intended to prolong life and preserve health, in addition to offering a means of self-defense. The techniques are meant to work in concert with internal breathing to create neigong (inner power). 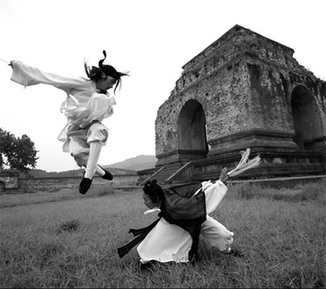 Because Wudang is also the birthplace of Taoism, its kungfu style incorporates elements from the religion. These include the balance of yin and yang, as prescribed in the Book of Changes; the eight trigrams (heaven and earth, thunder and wind, water and fire, mountains and lakes); and the five cosmological elements (fire, water, wood, earth and metal). As Wudang's fighting form was the first and the most prominent "internal" kungfu form, some other "soft" schools that did not originate from the area are sometimes erroneously categorized as Wudang style. There are several schools under the Wudang umbrella, including xingyi (form and will boxing), bagua zhang (eight trigrams palm) and light-bodied kungfu. Arguably, the most prominent is tai ji quan, which focuses on awareness of eight aspects of one's body - changeability, easiness, roundness, lightness, evenness, flexibility, precision and steadiness. One should cultivate oneself so that one is hard and powerful inside, but soft and smooth outside. This should enable the practitioner to "move like the waves of the Yangtze River flowing toward the ocean, one after another, never stopping". Personal cultivation is steeped in the practice of Taoist qigong, a method of fusing body and spirit through controlled breathing. It is based on a passage from Lao Zi's Tao Te Ching: "Empty the mind, and fill the belly; weaken the ambition, and strengthen the character." Wudang qigong can be practiced in 18 forms. The general principle is to first push the inner breath into a "small heavenly circle", which refines the energy and transforms the breath. This inhalation should then be spun through a "large heavenly circle", in which the breath is refined and the spirit is transformed, causing them to become one. Finally, all involved elements should fuse into a single integral, causing one to return to selflessness. So, as practitioners of Wudang kungfu know, mastering this martial art is really about understanding, quite literally, the ins and outs of the human body, mind and soul. Sixteen more items giving evidence of the Japanese invaders' atrocities during World War II have been donated to the Memorial Hall of the Victims in the Nanjing Massacre. China Unicom's high pricing strategy for Apple Inc's smartphone seems to have paid off at least for now after the company reported better-than-estimated iPhone sales yesterday. Tom Cruise holds his daughter Suri during a break in the filming of "Knight & Day". Pairing up for a shopping session, Halle Berry and daughter Nahla Aubrey were spotted out in Beverly Hills, California on Thursday. The environment where the couple grew up is totally different, so their ideas will be different too. Maybe it is called culture conflict?